Skateboarders from across the Coachella Valley and out of town will grind rails and kick-flip their boards Saturday for judges during an Epidemic Skate Shop competition at Palm Springs Skate Park. 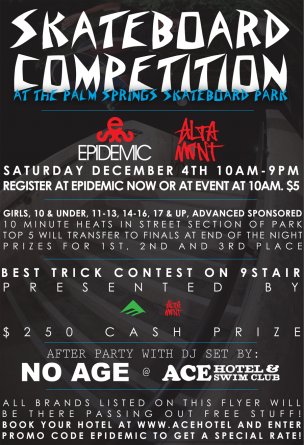 Sponsored by the skate shop, Emerica Shoes and Altamont Apparel, the competition is open to boys and girls in all age groups, with all levels of experience. Prizes will be awarded for first-, second- and third-place finalists. About 75 people have signed up. The last competition Epidemic sponsored drew about 500 spectators, Coy said. In addition to watching the skaters perform hair-raising stunts, big-name skate companies and magazines such as DVS, etnies, Analog, Vans and Circa will hand out free merchandise and products to competitors and attendees. The Coachella Valley Arts Scene will also be at the park with various arts and craft projects for kids who don't want to compete but still want to watch and have fun. DJ Alf Alpha is expected to drop tunes to keep skaters and the crowd pumped. For those 21 and older, an after-party is planned at the Ace Hotel and Swim Club in Palm Springs with DJ No Age. The hotel offers discounted rates for competition attendees. Epidemic arranged a special rate so you can stay the night at this killer hotel. Just use promo code “EPIDEMIC” when booking your room on Acehotel.com/palmsprings . Did you really say Jim Fitzpatrick?